You’ve graciously offered to throw a baby shower for someone. Perhaps it’s a friend, coworker, or family member. Well done! It’s a fun time, but planning can be stressful. 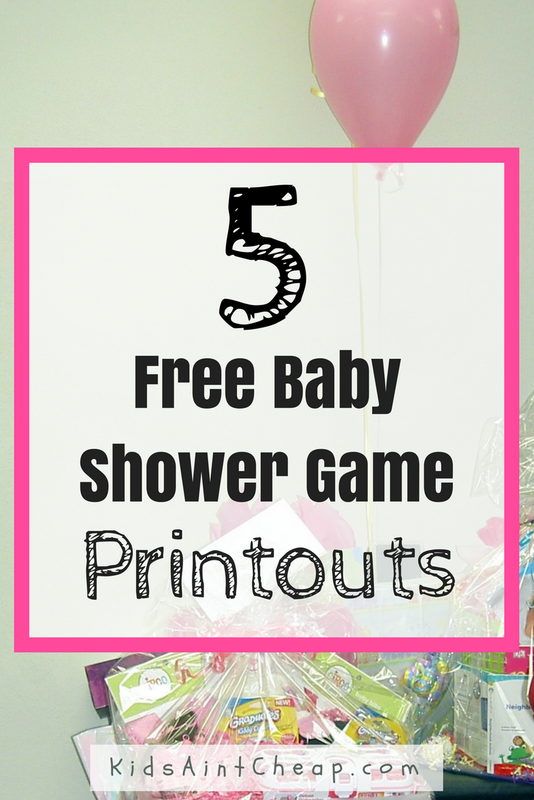 That’s why I’ve put together a roundup of free printable baby shower games to make the most of the mom-to-be’s special day. This is a game we used at my baby shower. Simply pass out the printable forms with a list of animals and have each guest write the names of baby animals of the same breed. for example, goose and gosling. Find your printable sheets for “Name That Baby” here. Print off your copy of “Name That Nursery Rhyme” here. Baby Bingo is a simple and fun game shower guests of any age can play. Print off several of these bingo cards – blue or pink. Make sure you have game pieces, candy, buttons, or coins for players to use for their cards. In each box, write what the expectant mother could potentially receive at her baby shower. For example, diapers, baby blanket, or lotion. Call out each item and see who calls “Bingo” first! Choose your printable “Baby Bingo” cards here. A great ice breaker that helps people interact with one another is a scavenger hunt. Ask your guests to form into teams of two or three, then give each team a copy of the first clue. The rest of the clues have been hidden by you throughout the house. I like this version of a scavenger hunt for a baby shower because each clue is fill-in-the-blank, making the clues more solvable and moving the game along at a nice pace. Make sure you have enough prizes for each team member to receive! Get your “Baby Shower Scavenger Hunt” clues here. Could you stand up in front of your friends and describe “Mary Had a Little Lamb” without using words? Try this fun version of charades that centers around popular nursery rhymes. Cut up each choice and have each guest draw one out of a hat to act out. Print off your nursery rhyme-themed “Baby Shower Charades” here. If you’re looking for more free printable baby shower games or need help putting together your theme, invitations, or snack ideas, then be sure to check the wealth of resources on Pinterest. These five games should help your guests break the ice and enjoy their time making memories and honoring their friend. Which baby shower games have you played? Share a favorite with us below!